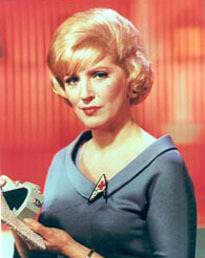 Older Star Trek fans recognize Majel Barrett as Nurse Christine Chapel, a recurring character in the original series. To younger Trekkies, she was Deanna Troi's meddlesome mother, Lwaxana Troi (Daughter of the Fifth House, Holder of the Sacred Chalice of Riix, Heir to the Holy Rings of Betazed). Even casual Star Trek viewers might recognize her voice -- she spoke for the ships' computers in every Trek series except the last, Enterprise. She attended her first acting class when she was 10, and made her stage debut at 20, in a Boston production of Models By Season. In the early 1960s, she appeared on stage often at the Pasadena Playhouse, and broke into television with guest roles on The Untouchables, Bonanza, The Lucy Show, and Gene Roddenberry's first series, The Lieutenant, in 1963. In his second series, Star Trek, Roddenberry cast Barrett as the ship's first officer. NBC immediately objected to the premise of a woman as second-in-command, so her role was downsized to that of an occasionally-seen nurse in Dr. McCoy's sickbay. Roddenberry and Barrett began dating, and married in Japan on 6 August 1969, shortly after the series had been cancelled. Roddenberry's divorce from his first wife had not yet been finalized, so for legal reasons he and Barrett were married again in America on 29 December 1969. For many years they lived in a house that had been built as Cary Grant and Barbara Hutton's "honeymoon cottage". Roddenberry died in 1991. In his will, he stipulated that each of his three children (two daughters from his first marriage, and one son with Barrett) were to receive equal shares of his inheritance, but that Barrett would manage the estate, and that their son would receive a larger share of the estate when Barrett eventually died. Roddenberry's daughter Dawn sued, alleging that Barrett had wielded undue influence on Roddenberry as his health had failed. But his will also stipulated, "if any beneficiary under this will in any manner, directly or indirectly, contests or attacks this will or any of its provisions, any share or interest in my estate given to that contesting beneficiary is revoked." Dawn Roddenberry withdrew her suit the day before it was scheduled to go to court, but Barrett was not a forgiving stepmother -- she countersued under that "you lose everything" clause, and Dawn Roddenberry got nothing. After Roddenberry's death, Barrett produced the sci-fi series Andromeda with Kevin Sorbo and Earth: Final Conflict. In 1996, Barrett, often called "The First Lady of Star Trek," guest starred on Babylon 5, the science fiction series that was widely considered to be Star Trek's challenger and competitor. Farther outside the Star Trek universe, Barrett appeared in A Guide to the Married Man with Walter Matthau, Westworld with Yul Brynner, and The Domino Principle with Gene Hackman, but her roles in such films were always tiny. She also voiced the computer in an episode of Family Guy, and the 2009 Star Trek movie reboot. In her will, she left $4M for her dogs, and another $1M for the animals' longtime caretaker.